Maison Blanche Paint Company’s Antique Wax is a premium formulation that has been manufactured from an old Dutch recipe for over 100 years. Well known for it’s quality, this finishing wax is used to give special protection to pieces painted with Maison Blanche Vintage Furniture Paint. Apply on top of our Furniture Paint to seal and protect your project, augmenting the natural beauty of your piece by enhancing the patina and enriching the texture. Antique Wax creates a lustrous finish as well as provides an additional vehical for embellishment. To Use: Antique wax is almost efortless to apply. It glides on easily and melts into your painted surface. It is a penetrating wax that soaks into your Maison Blanche Furniture Paint painted surface to strengthen and beautify. No fancy tools or expensive brushes needed to apply Antique wax. To obtain a natural shine, apply thinly with a chip brush, furniture staining pad, or soft cloth. Let dry about 15-45 minutes before polishing with a soft cloth. Follow with a second coat if desired. Close tin well after use. 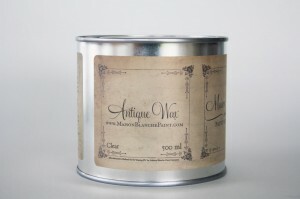 NO need to apply Clear Antique Wax prior to applying Dark Brown Antique Wax!